Brynn honors her passion for horses by studying at the toughest veterinary program in the country. Months from graduating, tragedy strikes—tragedy for which she can’t help but feel responsible. Brynn feels suffocated by the weight of her father’s legacy and his dusty hopes for horse show jumping success. When Brynn’s frenetic efforts to dig the family business out of debt fail, she’s down to one desperate hope. Enter Jason Lander, who understands what it’s like to walk away from the ring. The onetime champion agrees to train Brynn, and her horse Jett, for an all-or-nothing run at the prestigious Million Dollar Gold Cup. But going all the way means doing it his way, which has Brynn questioning her decisions, her loyalties, and her growing feelings for Jason—complicating her relationship with her lover. 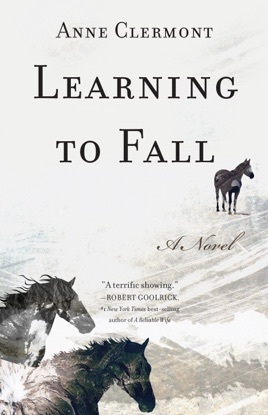 Set in Northern California against a stunning backdrop of coastal hills and valleys, Learning to Fall is about discovering how to let go—and how to hang on with your heart. Fans of Seabiscuit and The Horse Whisperer will love this beautifully written debut; one they’re bound to add to their shelf of favorites. What will be familiar in many ways to anyone with experience of the competitive world of horse showing, Clermont opens the doors and provides an honest (if not always pretty) window into the world: cutthroat and full of joys and struggles large and small. Wanting to live a more stable life, not depending on the vagaries of wins and losses, Brynn has dedicated her time to her studies in veterinary school. But, an accident and years of financial juggling left her family in deep debt, with few options for resolution, and Brynn is the key to the options. With a bit of help from another successful horseman, Brynn has both the key and the opportunity to help with the family’s troubles, but she has to make the choice. Years of the highs and lows of her father’s career have her wondering if she is just the person to survive it all, especially with the added pressures and need to succeed. Clermont is obviously writing with full knowledge of the unique people that are in the show world: from the good to the not so. The simple displays of wealth and the focus on the presentation and performance, the single-minded focus needed to complete a course successfully, and the hours of behind the scenes time and work that makes the 90 seconds in the ring look effortless. When added to the inner struggles that Brynn experiences this story is gripping and compelling, with plenty of moments to enjoy. While this won’t discourage or encourage anyone from setting their cap on the Grand Prix ring, it does present a sense of the struggles, expense and single-minded determination needed to start on the journey. As someone who showed horses for years, and experienced much of the camaraderie and cutthroat actions from competitors, as well as that specific bond that develops between horse and rider, I can’t help but find this book engaging. With a nice mix of finding herself while developing a new adult identity, Clermont has created a story that is sure to find many fans.